Michèle Magema, Goodbye Rosa – 2005 (2005). Tirage C-print, 120 × 160 cm. © 2005 by Michèle Magema. Permission to reprint may be obtained only from the artist. Michèle Magema’s Goodbye Rosa – 2005 appeared on the cover of the Summer 2013 issue of Signs (volume 38, number 4), a thematic issue edited by Sumi Cho, Kimberle Williams Crenshaw, and Leslie McCall titled Intersectionality: Theorizing Power, Empowering Theory. Michèle Magema’s work exists within an intermediary zone, a sort of mental space, or a frontier that she has produced and that she situate within the Southern and the Northern. Her feminine identity is at the center of her work. In effect, the feminine is represented as a metaphor for the human being. The exploration of this feminine identity displaced through time, memory, and history, reflects the image of a woman with a new identity that is totally detached from exoticism. Then in the midst of these dual metamorphoses, the double character image follows a parallel line to her dual cultural identity. The artist uses historical facts that she interprets through the production of scenes. The material of her work is always simple. She uses historical facts that she interpret through the production of scenes. Through these frontal images, she exposes her body that she uses as a metaphor for the relationship between the human being and the world at large. Her work sets up a direct relationship that certainly covers the field of society and politics, but it also relates to existentialism, and even anthropology. 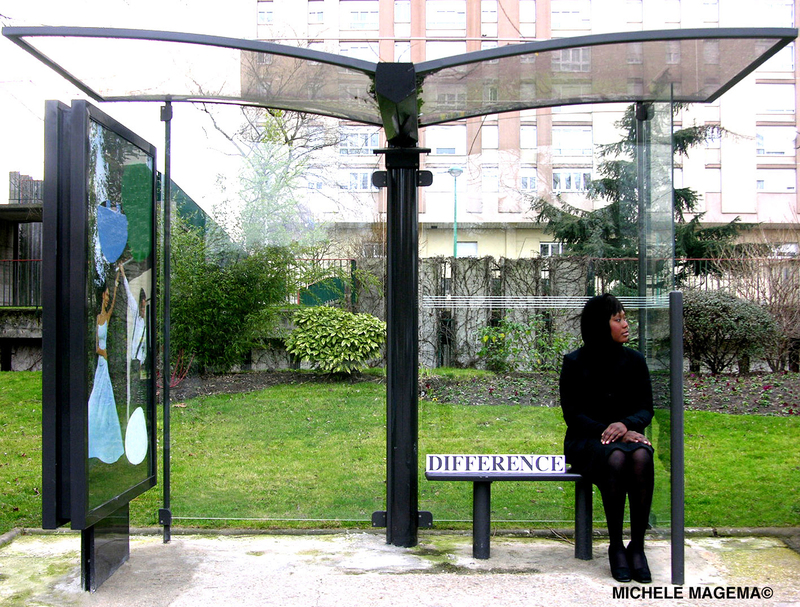 Michèle Magema was born in 1977 in Kinshasa and emigrated to France in 1984. She has lived and worked in Paris ever since. She received an MA in fine arts from l’Ecole Nationale Supérieure d’Arts de Cergy in 2002. A key focus, for her, is articulating a permanent exchange between her Congolese culture and her adopted French culture. She has been a resident artist at Cité Internationale des Arts and has exhibited her work in the Global Feminisms Exhibition at the Brooklyn Museum and at the Hirshorn Museum and Sculpture Garden. She has also participated in the Africa Remix exhibition.